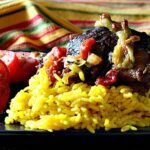 Short ribs, seared and then braised in the oven with onion, tomatoes, poblano peppers and spices bring a warm, delicious, tender ribs meal to your table. Braised Mexican Short Ribs are a warm and cozy meal. 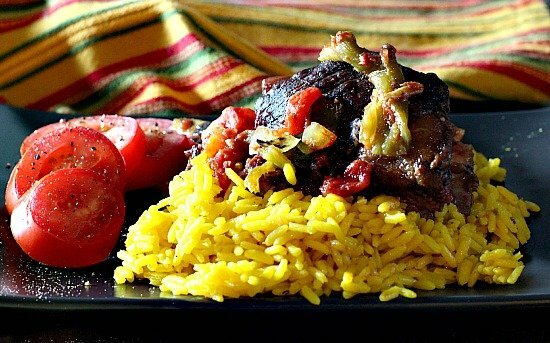 Thank you to Rick Bayless for this easy oven braised short ribs recipe. Searing the ribs first guarantee that you’ll have a fall off the bone experience. And one that’s entertaining worthy. 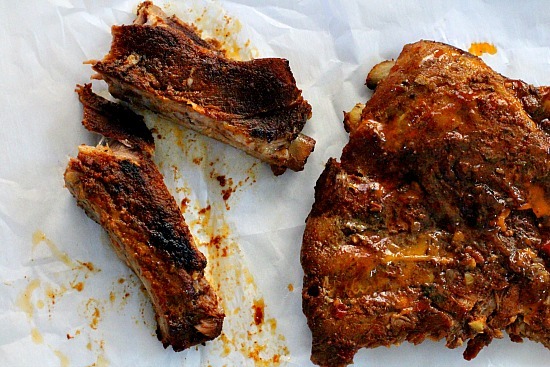 If you’ve never had short ribs, you’re missing out on one of life’s great culinary pleasures. Beef short ribs are tender and so wonderful with beefy flavor you’ll fall in love instantly. And with bone-in, you even have a built in handle for your eating pleasure. But you won’t need it. But you won’t need that bone, when braised and slow cooked, the meat will become fall off the bone tender. We invited our friends Carol and Mike over for dinner Saturday night. The Nuggets were scheduled to start play-off at 6:30, so my dinner menu needed to be mostly prepared in advance with minimal cooking after guests arrived at 5:00. I decided on this Rick Bayless short rib recipe. It’s a nice recipe for entertaining, because you can prep and cook before guests arrive so you not working in the kitchen after they arrive. For appetizers, a simple cheese and cracker plate. I chose a Cambazola cheese, with water crackers, a side of red grapes and an assortment of olives from Whole Foods olive bar. The olives are always a crowd pleaser. 1. Preheat the oven to 300°F. Roast the almonds on a baking sheet until fragrant, 10 to 12 minutes. 2. Grind the lavender very fine in a coffee grinder, or with a mortar and pestle. 3. In a bowl, toss the almonds with the lavender, sugar, salt and olive oil to coat. Serves 6. In the oven were sizzling Sizzle Shrimp. A favorite recipe I adapted from another favorite shrimp recipe. Carol will get back to me on the origins of this recipe. Moving to the dinner table we started with my favorite spring salad; Spinach and Strawberry Salad. I LOVE serving this salad for guests. Not only is it healthy and delicious, it’s a beautiful presentation. 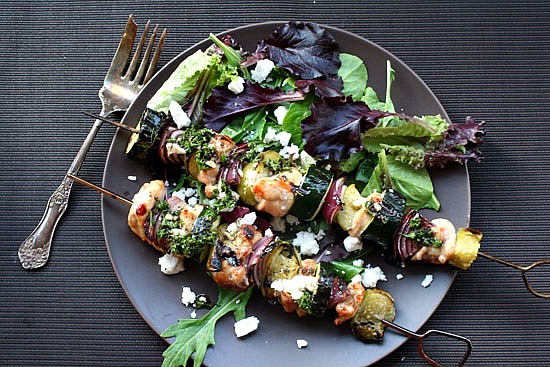 If you never take anything else from my blog, take this salad recipe and run. Roast the poblanos directly over a gas flame or on a baking sheet 4 inches from broiler. Turning regularly until all sides are blistered and blackened. Cover with a kitchen towel for 5 minutes and then remove most of the skin with your hands. Do not rinse away the flavor with tap water. Tear the chiles open and remove the seeds. Slice into 1/4 inch strips. Heat oven to 325 degrees. In a medium large Dutch oven, heat the lard on medium high. Lay in the short ribs in a single uncrowded layer, working in batches if necessary. When richly brown on one side, about 5 minutes, turn them over and brown the other side 3 - 5 minutes.Remove to a plate and tip off all but a generous coating of oil on the bottom of the pot. Set the pot back on the stove and reduce heat to medium. Add the onion and cook, stirring frequently, until golden. About 7 minutes. Add the garlic and stir for one minute. Add the tomatoes and cook until soft, about 3 minutes. Nestle the short ribs into the tomato mixture. Spoon some of the mixture over the ribs, cover and bake 1 1/2 - 2 hours or until meat is fork tender. Using a large spoon, remove the meat to a warm serving plate. Tip the Dutch oven to remove the fat from the tomato mixture. Take the sauce and season with additional salt and the fresh herbs. Stir well. 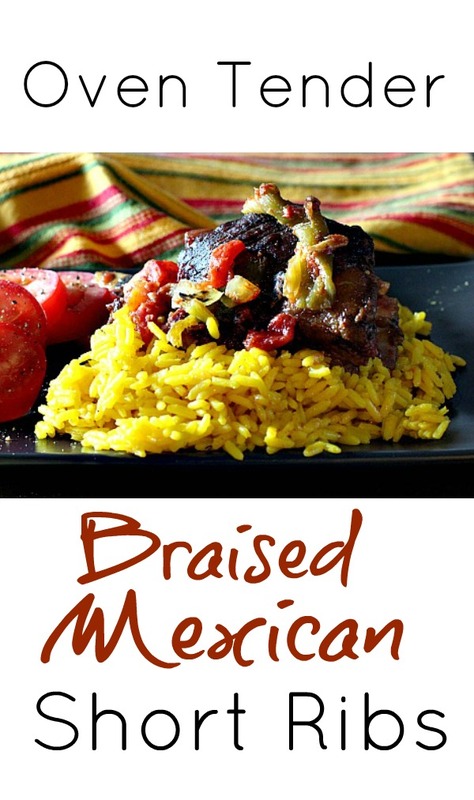 To serve, spoon a rib into a serving of Mexican Yellow Rice (or mashed potatoes) Spoon some of the tomato sauce around the ribs. It was a great meal…too bad the Nuggets lost that one. 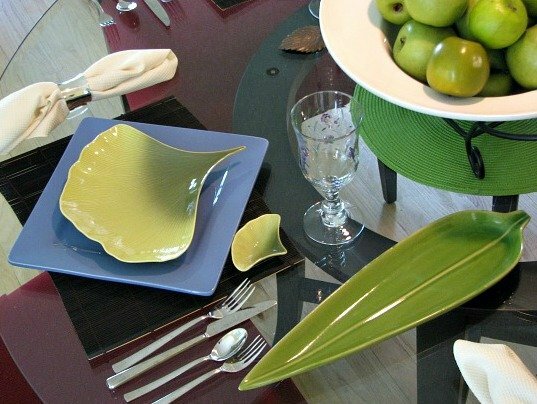 Beautiful table, delicious food, great friends and basketball – wow! I can’t wait to try your Spring Spinach Salad and please, please, please talk Carol into posting the recipe for the Famous Cream Cheese Flan!